Core Administrators and their staff are responsible for managing all aspects of a core. This includes maintaining the services and resources offered, managing requests and reservations, completing billing events, running reports and managing settings as needed. The first step in this process is learning to access and navigate your iLab site. 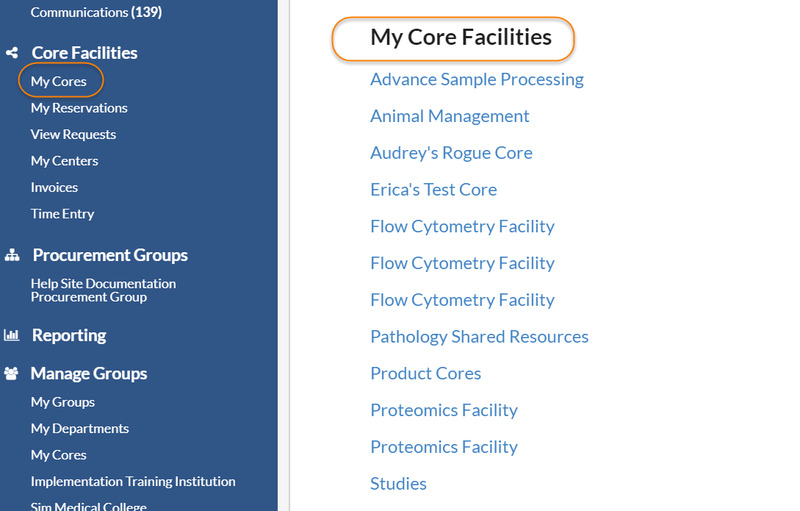 To access your core, either hover over the "my core" link on the left-side navigation and then select the core from the pop-up, or click on the "my core" link and then select the core from the list on the right. If you are administrator to only one core, the name of your core will appear in place of the 'My Cores' link. Upon entering your site you will see numerous tabs across the top right side. Certain cores may have additional modules enabled on their iLab site. Contact Support‍ if you would like to learn more about these modules (note: additional charges may apply).